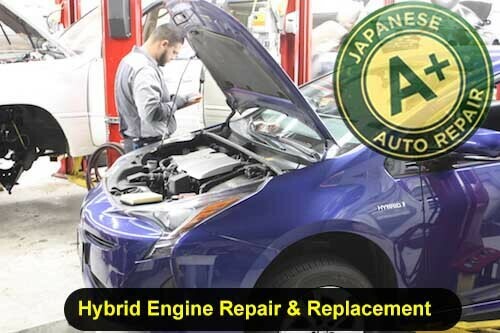 San Carlos Engine Repair & Service - A+ Japanese Auto Repair, Inc.
Have you ever looked under the hood of your car and wondered what was going on in there? A car engine can look like a complicated system of metal, plastic, sensors, hoses, and wires. A+ Japanese Auto Repair will we take the time to explain the inner and outer workings of the engine as they relate to auto service or an auto repair your vehicles engine may need. Our facility believes that taking the time to educate our clients on how the engine systems work will allow for a transparent auto repair process from an engine oil change to a major engine replacement or repair. What is an engine oil change and how often do you need to change your oil? How long will a radiator last, how do I know if the radiator is bad, and how much will it cost? What is a timing belt and when do I need it? Do I need an engine tune up? Typically, newer vehicles will hide the complexity of the engine under a plastic cosmetic cover of some sort (Fig A.) but remove the cover (Fig B.) and marvel at the complex engineering that has gone into designing an engine that can last 200,000 miles or more. This process happens hundreds of times per minute to give you an idea on how fast this occurs in your vehicles engine. We have all experienced when there is an engine related issue. It could come as a misfire, rough running, lack of power, or multitude of other concerns that can arise when something is affecting the way your vehicles engine is running. We inspect, service, and repair all engine components of passenger vehicles and trucks at A+ Japanese Auto Repair in San Carlos. Engine items that we regularly service are timing belts, spark plugs, engine oil change, leaking valve cover gaskets, and cooling system work. Please feel free to give us a call if you have any questions. 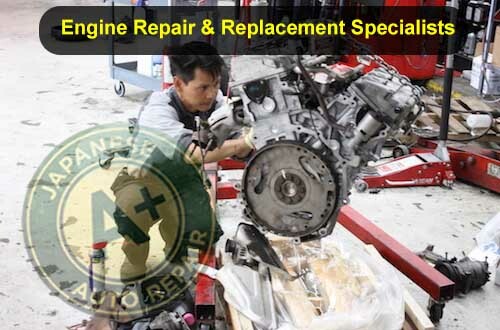 A+ Japanese Auto Repair in San Carlos | 650-946-1856. Hybrid vehicles use both a combustion engine and a electric motor to power the vehicle. The combustion engine is also known as your vehicles motor, engine, and powertrain. Hybrid engines are not much different than regular gasoline combustion engines. The difference is that they will sometimes de-tune the engine or change the timing of the engine in order to make the engine more compatible to starting and stopping of the engine. When it comes to repairing or maintain your vehicles engine A+ Japanese Auto Repair employs experts at everything from engine oil and filter changes to engine rebuilds and replacements. 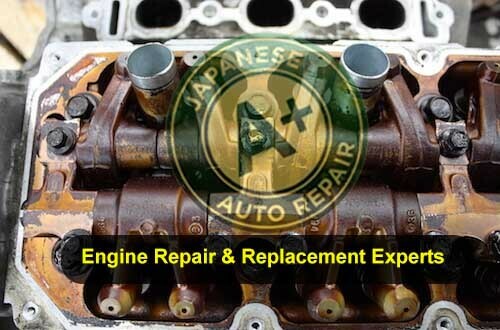 San Carlos Engine Repair & Service Experts - A+ Japanese Auto Repair Inc.
A+ Japanese Auto Repair has ASE certified technicians that are experts on combustion engines and engine repair. We employ highly trained mechanics to service and repair engines in the following vehicles: Honda, Acura, Toyota, Lexus, Nissan, Infiniti, Mazda, Subaru, Mitsubishi, Kia, Scion, Hyundai, Isuzu, and Hybrid vehicles. A+ Japanese Auto Repair requires that our ASE certified mechanics constantly train on new engine systems, engine diagnosis, and engine repair. This assures that our mechanics are able to diagnose and repair any engine issues properly and efficiently. When it comes to engine repair for your vehicle the value of having an efficient knowledgeable mechanic is cost savings. Our commitment to our clients is we perform engine repair and auto repair the first time every time. If you have any further questions regarding this common auto repair please stop by A Plus Japanese Auto Repair for a free consultation today. Alternatively feel free to contact us 650-946-1856 or make an appointment today.